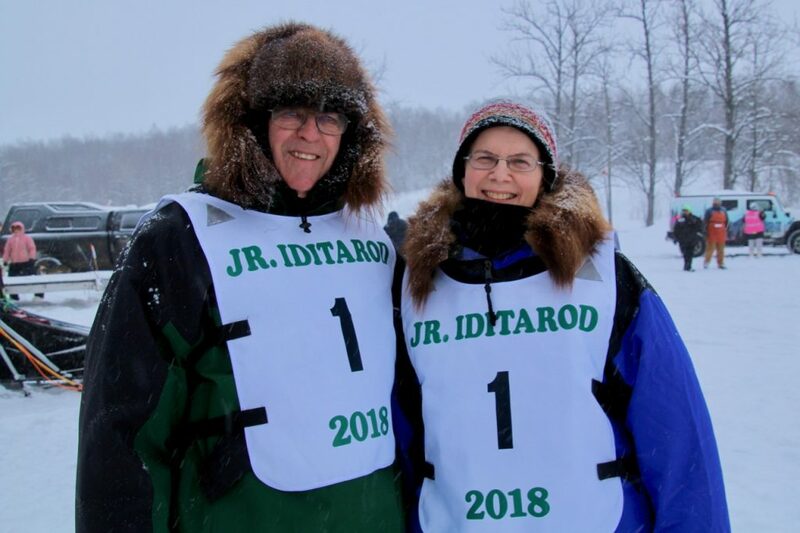 The JR Iditarod salutes Bernie and Jeannette Willis as the honorary mushers for the 2018 race. The Willises will be wearing bib #1 for the start of the 41st JR Iditarod. The race will begin on Saturday Feb 24th at 10:00 am within shouting distance of Joe and Vi Redington’s former homestead on Knik Lake. Eleven mushers ranging in age from 14 to 17 will participate in the 150-mile race. It’s a long-standing tradition for both the JR Iditarod and Iditarod to honor people who have given their time, energy and talents to the race. For decades the winner of the JR Iditarod has received a Willis sled and sled bag. Bernie crafts the sled and Jeannette fashions the sled bag. As parents, Bernie and Jeanette have had a long history with the JR Iditarod. Their children have all participated in the race. Andy ran four times. In ’92 he finished 10th, 93 – 5th, 94 – 3rd with the sportsmanship award and 95 – 2nd with the Humanitarian award. Andy has also finished Iditarod twice. Janet completed the JR twice claiming 5th place in ’99 and 7th place in ’01. As a rookie in ’97 Tony won the JR Iditarod and in ‘00 he completed the Iditarod. Bernie and Jeannette moved to Alaska in 1969. They served as missionaries in Gambell on St. Lawrence Island. They learned to travel by dog sled and Bernie started building traditional sleds. As they relocated throughout Northwest Alaska they continued mushing, building sleds and sewing sled bags. Bernie entered the Iditarod in 1974 and again in 1989. He also traveled to Russia by dog team in the 1992 Hope Race. More than 500 sleds have passed through the Willis shop. He was a master of traditional sleds as well as mid-distance and long distance sleds. Jeanette, a master designer also, created bags for every type of sled. Bernie caught the mushing bug long before he arrived in Alaska. It was through a book he read in 4th grade and other library books that he learned about the sport. He built his very first sled at the age of 16 in his high school shop class. Willis said it was put together like a solid piece of furniture with sturdy strong mortise and tenon joints. He learned quickly that sleds needed to be flexible. Quickly his goal changed from “solid” to flexible. Willis sleds are built to meet the challenges of the trail. For a sled to pull easily it must be flexible for a sled to hold up over time it must be flexible. Bernie said his first sled is still around, not on a trail with sled dogs loping in front but sitting on the front porch proudly holding flower pots. After moving to Anchorage, Jeannette began teaching a mushing class through the University of Alaska –Anchorage. The course was called Mushing 101. Over the twenty years she taught the class, many were introduced to the ins and outs of the sport. Jeannette said the class wasn’t just about the skills of mushing but about letting people see the joy of the dogs in doing what they were born to do – run and pull. She not only shared her knowledge of the sport through the class but in a broader sense she’s shared her knowledge of the sport through designing and sewing sled bags. Bags Jeannette designed and created have the features and materials that made them serviceable and durable. Each year the JR Iditarod Rookies are presented with a Willis designed emergency sled repair kit. From his own experiences, Bernie knows that sled breakdowns can occur at the worst possible time and in the worst possible places. Having a small repair kit that’s loaded with the right tools and the right materials makes even the biggest sled emergency manageable. A race like the JR Iditarod couldn’t happen without people like the Willises giving of themselves for the good of the kids, the dogs and the race. For all the sleds and sled bags the JR Iditarod champions have received, we celebrate and thank Bernie and Jeannette.